We have very kindly been given a stall on Saturday 9th February 2019 in the Pavillion for the Steampunk Weekend. Please come and visit us. We will be at the summer Steampunk Festival also - by kind invitation of the Whitby Steampunk organisers. This is such a fun, friendly event - please come along and join in. Stokoemotiv Whitby FC take on the newly formed F.C.Gothenheim at Whitby Town Football Club on Sunday 28th April 2019, doors open 1pm, kick off 2 pm. Entry fee £1 and raffle £1. 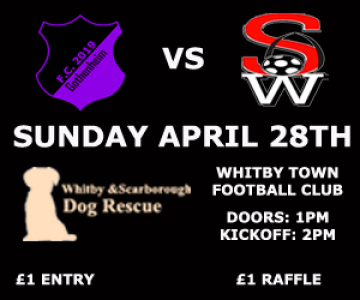 Whitby and Scarborough Dog Rescue are very grateful to have been chosen as the local charity to benefit from this awesome Charity Football Event alongside the usual Real Gothic FC charities- Willow Foundation and SOS Childrens Villages UK. Please come along and support your chosen team, all the charities and have a jolly good time to boot! We are delighted to announce that we have been invited to do the 'Scruft's Dog Show' at this years Regatta . We will be in the same place as last year in Crescent Gardens from 10 am on Sunday morning. The dog Show will start at 11.30 and events will include: Most Handsome Dog, The Prettiest Lady, Cutest Pup, Waggiest Tail, Best Rescue Dog, followed by the Show Champion. Please come and support us - it will be a great fun time for all the family! Our Big Thanks to the Regatta for letting us host this event! We will be having a stall at this years Egton Show- we had such a great time last year which we hope will be repeated this year. It is always so lovely to see our rescue dogs with their new owners - and everyone has a great day out as well! Sunday 29th July 2018 - Sorry but we have had to cancel todays stall as it is just too windy - gusts at the Dock End this morning at 8 am would damage the stall so with stronger winds forecast we took the decision to cancel on safety grounds. Apologies for this but we hope you will joing us at Regatta or Egton Show- thanks. Please come along and visit us at the Dock End - all money raised goes towards the upkeep and welfare of the dogs in our charge. Thanks. Collection tin 28 Aug 2016 £78.25 thank you!